Matt and I used to live just around the corner from one of the best Italian specialty stores in Brooklyn. Caputo’s. Oh dio, this place is fantastic. They import the best stuff from Italy and make their own sausages and fresh pastas. They also make mozzarella and ricotta several times a day so it’s always extremely fresh. Needless to say, we were there a lot. Note: This story gets a little sad… It was actually the owner’s elderly father who made the mozzarella and he liked to pick out the perfect ball for each person, dip it in the salty brine and hand it to you himself. It was very sweet. So one day Matt and I go in and order a bunch of stuff and as we’re chatting with the old man, he asks us how long we’ve been married. We tell him and he tears up, grabs my hand and tells me that his wife died. So of course, I tear up as he says how much he misses her. Now the old man and I are creating quite an awkward spectacle. Not what people expect to see as they’re buying their gnocchi. The owner comes out from the back and calms his dad and explains that his mom actually passed away a few years ago but his dad forgets this. Then he kindly hands me a tissue as I am no longer at all sanitary. After that day, for some reason, every time the old man saw me, he would burst into tears. I felt so bad that I was triggering this reaction that I would lurk outside to see if the old man was there, and if he was, I would get the counter guys to sneak a mozzarella ball into my order while I would duck behind the counter. He stopped working eventually but mozzarella now has this bitter-sweet association for me. Maybe now it will for you too! You’re welcome. This salad is almost as easy as it is pretty. 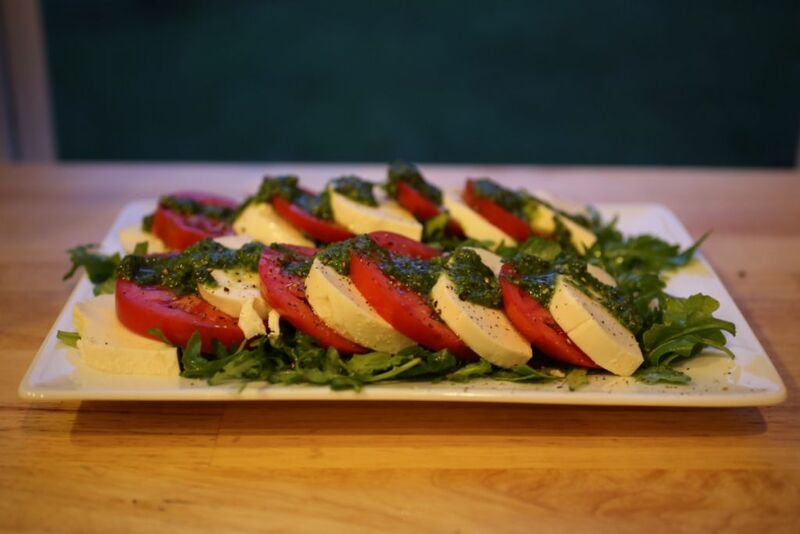 It’s kind of like a classic Caprese, with the addition of arugula and pesto instead of basil leaves. In a bowl, toss the arugula with salt, pepper, vinegar, and 3 tablespoons of oil. Slice the tomatoes and mozzarella to the same thickness, about a 1/2 “. Cut the mozzarella in half crossways so you’ll have the same number of cheese and tomato slices. 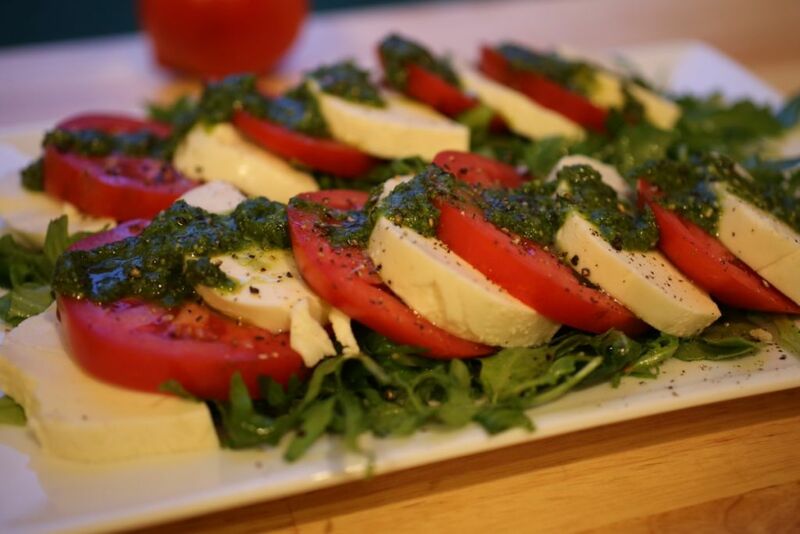 Make a bed of arugula on a platter and arrange the tomato and mozzarella slices on top, alternating between each one. Drizzle with pesto or chopped basil leaves (or tuck a basil leaf between the cheese and tomato, if you’re fancy like that). Drizzle on the last tablespoon of olive oil, a sprinkle of sea salt and a bit of cracked pepper over the platter and serve. Don’t even bother with winter tomatoes. This is a summer-time pleasure. Store tomatoes outside of the fridge, stem side down. It keeps them from turning mealy and getting bruised. You can make this in advance but you don’t want the cheese to be cold so give it at least 30 minutes to warm up before serving. Sprinkle salt on at the last minute to keep the tomatoes from losing all their liquid.